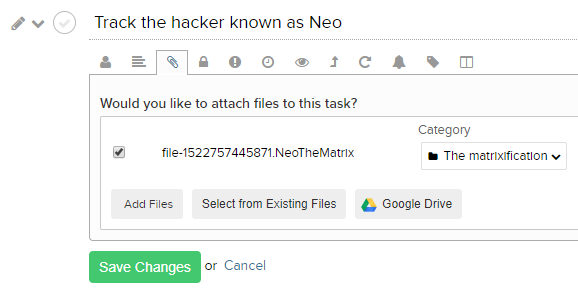 Within Teamwork Projects, you can attach a file to any task that you have access to. You can do this on an existing task or when creating a new task. 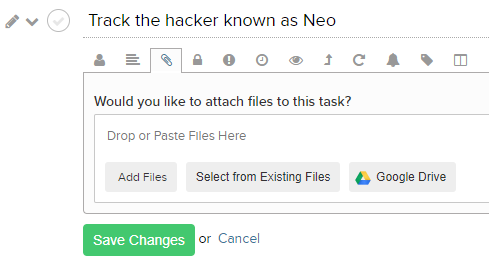 To add a file to an existing task, click the edit pencil to the left of the task name, and go to the task's files tab (paperclip icon). Add files: Upload new files to project from files stored on your computer. Select from existing files: Allows you to choose from files already uploaded to the projects file area. Integrations: If you have any file storage integrations enabled on your project, you will be able to add files directly from one of those. When selecting from existing project files you will be able to view the categories that the files are under and select from those. You can choose one or multiple files to add to the task and also view details of each file before selecting. Once selected you will see the file under the files area of the task along with the category it belongs to. Once you are happy with your files selection you can select Save Changes. 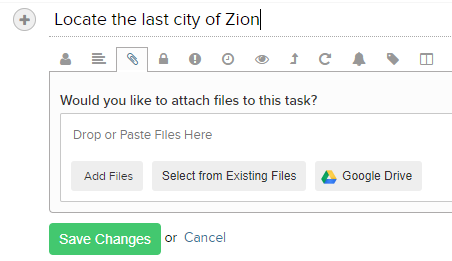 You can also add a file directly to a task when you are first creating the task. To do this, click on the paperclip icon when creating to select a file. You will then have the same options to add a new file, select from existing project files or choose from an integration.